From this tutorial you’ll learn how to change WordPress login page logo from default to the custom one. Log in to the hosting server cPanel file manager. Here locate your theme folder. Open it. Navigate to wp-content/themes/theme-name folder. 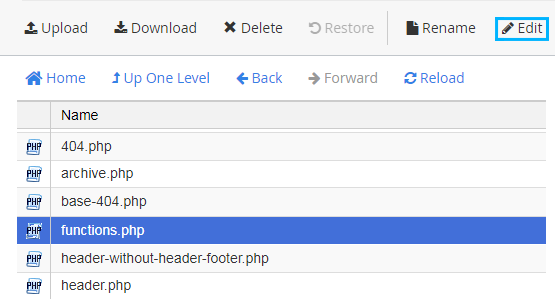 Here you need to edit functions.php file. Click on Edit to make changes in the file. Add the following lines of code to it and save the file. The next step is to upload logo_admin.png file containing your custom logo to the /wp-content/themes/theme-name/assets/images/ folder. As a result, you’ll be able to see a custom logo when entering WordPress Dashboard.